Dye Verse UK: Creative Saturday… and worrying Weld..
Creative Saturday… and worrying Weld..
After the thunder woke me this morning, I decided to get started on some “sorting out”. Spent about an hour or so hovering around the post box, waiting for my delivery of Giraffe Fibre from Wingham Wool. Photographed my Weld experiments from earlier in the Month. I used 5% extract from DT Crafts, and it proved a lot lighter than some of my other dyebaths of Weld in the past. But the originals were from the fresh plant – all of it – from what I can remember stewed for an extensive amount of time (I had forgotten about them, whilst I went and did something else – oophs), and this was extract. Feeling a bit concerned though that I may have given someone a bum steer on the colour matching, I went back and checked against reference books and it was definitely more gamboge in Eva Lambert's book of Natural Dyeing. In her wool matching though – it was fresh weld used 100-200% with Alum Mordant at 8%, and it mentions that different parts of the plant have different amounts of colour within them. 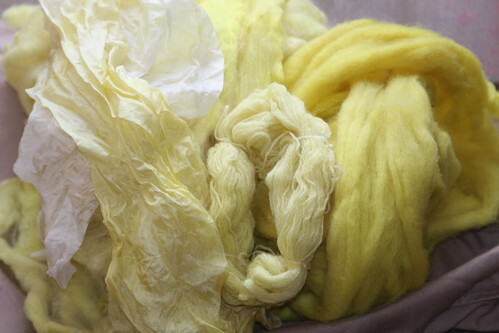 According to some of the reference book and sites though this could be down to the water in our area, and this is the yellow that people strive to achieve and again in Eva’s book, it is the colour she achieved with Silk 30-100% with alum mordant at 8%. We have hard water here, and my previous experiments were definitely in soft water and without the addition of some of the quite harsh chemicals we are subjected to in Bristol. This was the colour replicated from my instructions, and I wish I had the technology to overlay the colours from my earlier testers, as they are very close. The other factor that I thought may have come into play is these samples are over 10 years old – any thoughts anyone?